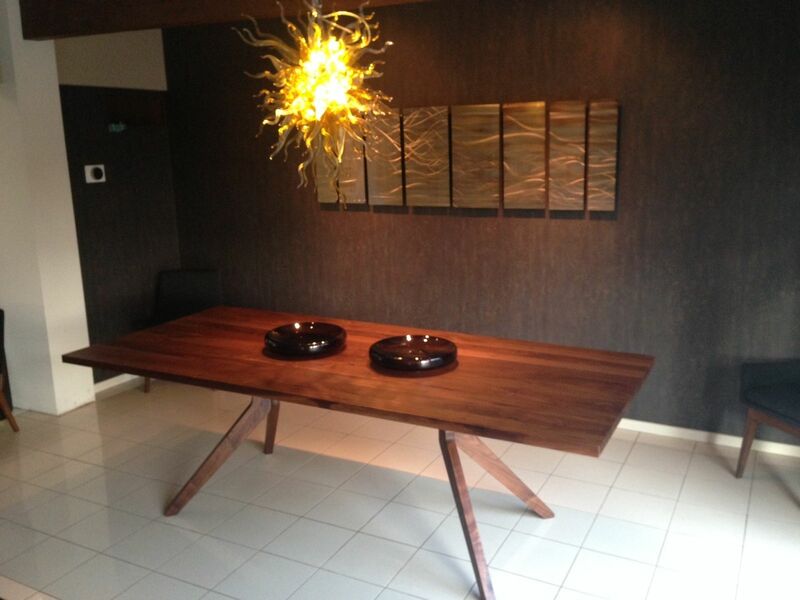 After careful communication between the customer & craftsman, this Walnut Dining Table was constructed and delivered. Actually, the craftsman constructed/delivered only the 1-1/2" thick x 40"wide x 96"long walnut dining table top. The customer originally was going to use metal legs for the table top, but later chose to have walnut legs made by another craftsman. The wood for the walnut table top was hand selected at a local hardwood lumber store & planed to 1-3/4" thick. Once back at the craftsman's wood shop, the planed walnut boards were cut to secure the best color/design of the boards. The boards were finally glued, planed, & cut to a finish size of 1-1/2" x 40" x 96". All surfaces were then sanded smooth & a liberal coat of light walnut Danish Oil applied/wiped off. After drying, the top was buffed with liquid wax. Steve is an AMAZING artist/craftsman. Steve was professional from the very beginning of working with us. His patience, communication and willingness to listen made the entire experience enjoyable. 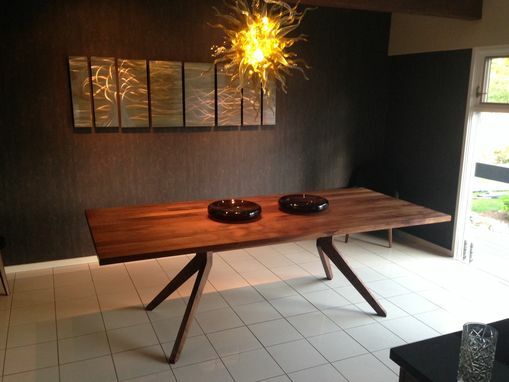 We could not be happier with the BEAUTIFUL table he built for us. We would recommend him to anyone and will definitely be using him again in the near future. Thanks Steve!! !